Whether you prefer modern day or ancient reptiles and amphibians, 2014 was a banner year for new species discoveries. From dancing and thorn-bearing frogs to giant flying reptiles, there was something to evoke wonder in just about everyone. The following represent just the tip of the “new species iceberg”…please be sure to post your own favorites below. Dr. Jodi J. L. Rowley has been bringing undiscovered frogs and new information to light with amazing regularity, but this time she’s outdone herself. 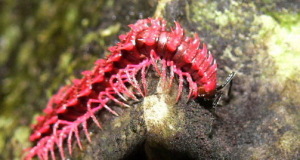 Sporting a pink belly and gold-flecked eyes, males of this aptly-named species are covered with thorn-like skin protuberances. 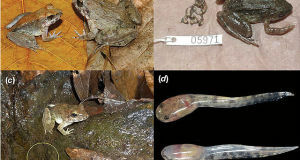 Believed to advertise mating fitness, the ‘thorns” grow larger during the breeding season – yet another example of the amazing diversity of amphibian breeding strategies (see Dancing Frogs, below, for others). The Thorny Tree Frog was found in a dense cloud forest in central Vietnam. Females deposit their eggs in water-filled tree cavities, but much remains unknown about other aspects of their life history. You can read the article describing this new species in the article linked below. I’ve always been fascinated by the extinct flying reptiles known as Pterosaurs, even more so visiting the American Museum of Natural History’s fantastic exhibit on their evolution (please see photo of related species). New species seekers must often be satisfied with a single specimen or, in the case of ancient creatures, a bone fragment. But the first individual of this species was found in the company of approximately 50 others of all ages and sizes – quite a treasure trove! Brazil’s new Pterosaur, which lived during the Cretaceous Period, appears to have been quite social. Indian Dancing Frogs, Mixrixalus spp. The tropical forests coating the Western Ghats Mountains of southern India are home to a huge array of previously-unknown amphibians and other creatures. In 2014 alone, 14 new Dancing Frogs have been described – more than have been described since the genus was created. Like other amphibians that live near swift-flowing streams, male Dancing Frogs have had to evolve novel ways of attracting females (their voices would not be heard over the rushing water). True to their name, the males’ solution is to twist, turn, and extend their feet outward in a variety of unusual “dancing” routines (please see photo)! Although measuring a mere 2.4 inches, this new-found lizard is quite striking. Colored in pearl gray and marked with jet-black stripes of varying shapes – some of which resemble handlebar moustaches – it resembles none of its many relatives. 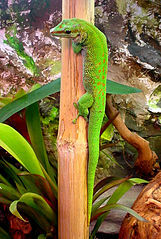 The Sai Yok Bent-Toed Gecko is known only from several limestone cliffs in western Thailand, where it dwells in dry evergreen and bamboo forests. 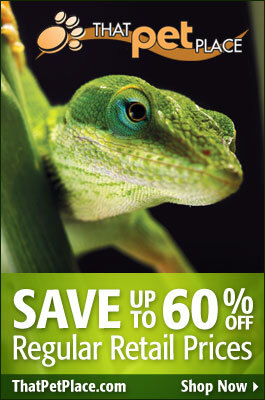 It is the 6th endemic reptile to be found in the region in recent years. This brilliantly-colored frog was at first thought to be a color variation of the well-known Strawberry Dart Poison Frog (Oophaga punilio). It dwells in a region that has been intensely-surveyed, so the revelation that it is quite distinct from its more common relative was something of a surprise. Geminis’ Poison Frog is clad in “screaming” orange-red, similar to the related species pictured here, but without the areas of black coloration. It is known only from Panama’s Rio Belan Basin, where it seems limited to elevated sand ridges within rainforests. This unique habitat is under pressure from human immigration, mining exploration, and agricultural expansion. Next: Frog Facts: New Species Has Fangs and Gives Birth to Live Tadpoles! I have decided to become a zoologist with a phd in zoology, perhaps to be a wildlife biologist. Do you have any suggestions on how I may go about it? One question has been bothering me. Does it matter which university I go to?